War correspondent John Pilger's latest documentary Utopia is coming to DVD and iTunes this 2nd December, ahead of its ITV transmission and courtesy of Network Releasing. Extras on the physical release will include more than four hours of unseen footage taken during the making of the film, and a booklet by Pilger expert Anthony Hayward. The recommended retail price for the DVD release will be £14.99. Utopia is a vast region in northern Australia and home to the oldest human presence on earth. 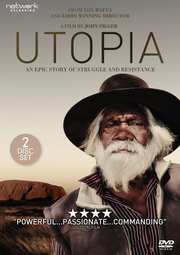 “This film is a journey into that secret country”, says Pilger in UTOPIA. It describes not only the uniqueness of the first Australians, but also their trail of tears, betrayal and resistance, from one utopia to another. Pilger begins his journey in Sydney, where he grew up, and in Canberra, the nation’s capital, where the national parliament rises in an affluent suburb called Barton, recently awarded the title of Australia’s most advantaged community. Barton was named after Edmund Barton, the first prime minister of Australia, who in 1901 introduced the White Australia Policy. ‘The doctrine of the equality of man,’ said Barton, ‘was never intended to apply to those who weren’t British and white-skinned.’ He made no mention of the original inhabitants who were deemed barely human, unworthy of recognition in the world’s first suburban utopia. One of the world's best-kept secrets is revealed against a background of the greatest boom in mineral wealth. Has the 'lucky country' inherited South African apartheid? And how could this happen in the 21st century? What role has the media played? Utopia is both a personal journey and universal story of power and resistance on how modern societies can be divided between those who conform and a dystopian world of those who do not conform.